This gorgeous canvas art by Tina O. is a print on wrapped canvas that will be a stunning addition to your home decor. Hang this piece over a bright accent table or hang alongside coordinating wall art, and its range of colors will add class to any room in your home. This beautiful flower vase wall art is a gorgeous piece, that will be a treasure for your home. It's packaged with care and is shipped to you ready to hang on your wall. Kiera Grace 20 inch Emerson Round Wall clock has evolved from merely being functional timepiece devices to wall dicor products with a secondary time keeping function. Strict quality control at production: we check all the movements individually to make sure they function properly at the factory before assembling clocks. Black and White. 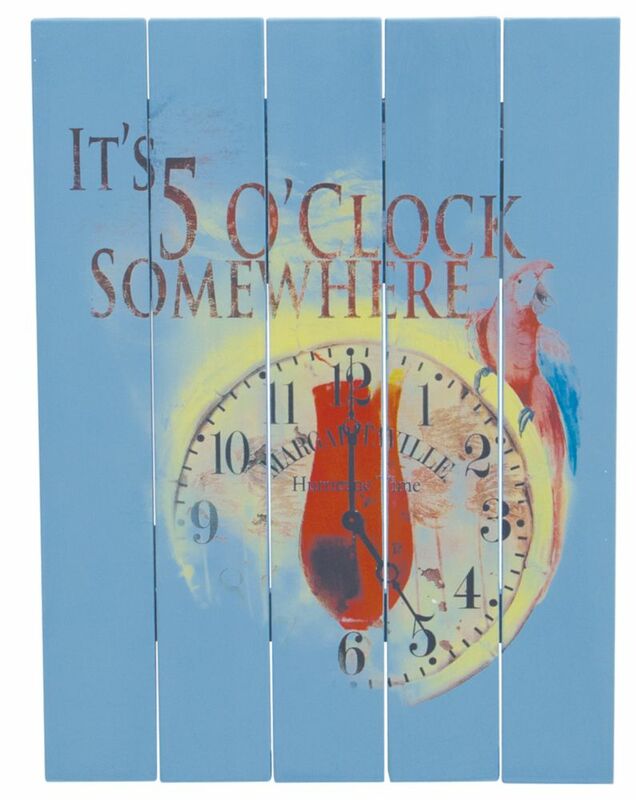 Outdoor Rectangle Sign "It's 5 O'clock Somewhere Margaritaville<sup></sup> Outdoor Wall Art Signs are perfect for inside or outside on the patio. They are made of Pine wood and come with a quality Sherwin-Williams<sup></sup> paint finish.